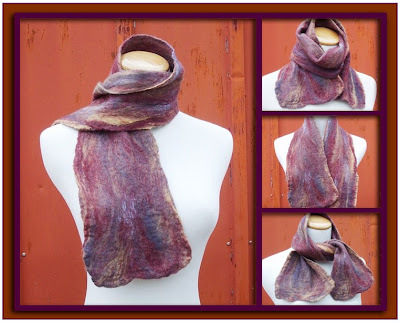 The Funky Felter: Want a Chance to Win this Handmade Nuno Felted Scarflette? If so, make your way over to The Felting Blog at CraftGossip! Want a Chance to Win this Handmade Nuno Felted Scarflette? If so, make your way over to The Felting Blog at CraftGossip! By the way, I've had a few people email me to ask how to comment on the post at CraftGossip. If you go the main page of the Felting Blog, you'll need to click on the comments link directly under the post title, and then scroll to the bottom of the page to leave your comment and contact information (name/email). If you click on one of the direct post links here, it should take you to the post where the comments are already showing and a box is visible for you to comment at the bottom of the page. Please read the entry instructions before commenting though because there is something specific that you need to comment about to enter. Oh, and you have to leave a comment over there to enter, not here. Be sure to read all about it at the Felting Blog at CraftGossip and make your entry comment over there. You are always welcome to comment here, but it won't enter you into the contest. Thanks so much to those of you who have already entered! I look forward to giving this scarflette away to someone who I know will appreciate it and wear it with flair. Maybe it will be you!